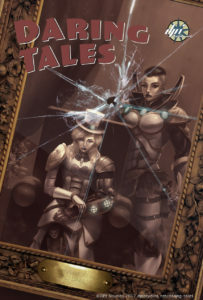 A collection of short stories introducing various characters from our steampunk illustrations. Sabina Frost is one of the finest infiltrators the world has known. Lady Ravendale, the head of Ravendale exports, has a reputation of being able to get whatever you need, for the right price. Now Ms. Frost has been caught on a highly delicate mission by the Baron Rosso deep inside his highly secure factory. It is up to the Lady Ravendale and her elite guard to get in and get out with her old friend and the information we hope she has procured. Start reading from the beginning. The Shaman’s Chest is an item of mysterious origin. Our heroine, Dasha, worked hard to get it only to have snatched from her by Sydney Wolfe and her GAL agents. Using her network of underworld contacts Dasha has learned who Sidney is planning on selling it to , when, and where. 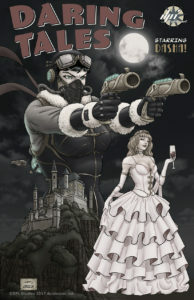 The castle Narcisse is a fortress high in the mountains, but nothing will stop our high flying aviatrix from reclaiming her prize. Come with us as we join Dasha in a tale of intrigue and adventure as she battles to outwit her nemesis and come out on top once again.